A family owned business for over thirty years. 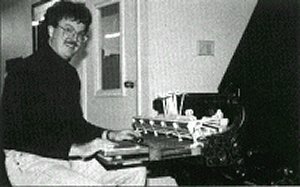 Michael Sweeney (shown here as a young man) has been working in the piano restoration business for over 40 years. Having sought private apprenticeship with established technicians as well as academic studies at Temple University, Michael has established himself as one of the premier piano craftsmen in the Delaware Valley. Over the years, Michael's studies have developed into a specialized interest in grand and baby grand pianos, exclusively, and for good reason. Since the grand piano is considered by artist and technician alike to be the apex of musical invention -- both aesthetically and technologically -- the complexity of the instrument warrants special focus. In other words, professional specialization is demanded by the integrity of the instrument itself. This focus, Michael believes, offers the possibility of a type of skill and perfected knowledge of the instrument that a craftsman needs in order to transform one's basic skills into a science. This knowledge, even though always 'behind the scenes,' is absolutely necessary for the musician who, relying on the technician's craft, transforms the mechanics and acoustics of wood, strings and hammers into music. In this way, craft becomes science and the result of that science becomes art. Since Michael began his musical career in solo performance, he understands the relationship between quality sound and well working mechanics. And he knows the artist's desire for a superior instrument. As every musician can attest, a good performance demands an instrument that 'begins in greatness,' but also one that is kept great through skillful maintenance. Besides technology, Michael also appreciates not only the simple, elegant beauty of the grand piano, but also the way pianos gather families and friends together. Pianos are intrinsically inviting. They suggest sociality, participation and holiday cheer. In fact, the piano -- especially the grand piano -- reflects what is perhaps most unique about humanity: the sophistication of art and the refinement of human cultural achievement. But even on an everyday level, as many customers have testified, pianos have the amazing ability to transform houses into homes, where the 'music room' becomes the "warmest room," especially during the early evening hours. Take a virtual tour through the photo gallery to experience not only the technician's craft, but also to see for yourself the beauty of these fine vintage pianos. Read letters sent to us from our clients. Read reviews from local news about our company and services. Visits to our shop by appointment only. Contact Us.